Ribonucleic acid (RNA), like DNA, is an essential part of living beings. It is a single long strand of nucleotides that is used in the synthesis of proteins, gene expression, duplication of genetic material, gene regulation and more. As such, there are many types of RNA. For example, the coding of messenger RNA, which is obtained from DNA, determines the amino acid sequence in proteins. Transfer and ribosomal RNA have different functions to that of messenger RNA. RNA differs from DNA in three major ways even though both are nucleotide strands. Firstly, RNA contains ribose rather than deoxyribose. Secondly, the complementary base to adenine is uracil rather than thymine (as in DNA). And finally, the RNA nucleic acid is a single strand rather than the double strand found in DNA. RNA crystals are grown so that their three dimensional structures may be studied. This is useful for genetic research, studies of protein binding, drug development research and much more. Since RNA is composed of the same or similar nucleotides as DNA, it's optical properties are nearly identical. The nucleotides in RNA absorb ultraviolet light, generally from 250 to 270 nm and fluorescence is not a viable analytical technique. 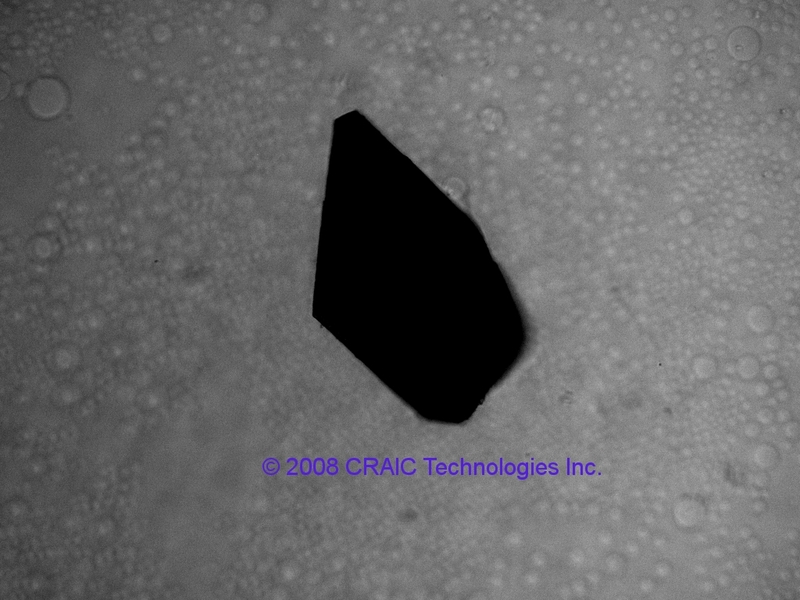 Therefore, most RNA crystals are analyzed by their UV absorption at 260 nm. UV microscopes and UV microspectro-photometers are used to analyze individual RNA crystals both in solution and after being extracted. Microspectrophotometers can even be used to determine the concentration of RNA within the crystal and the RNA crystal purity. As protein often contaminates RNA samples, RNA purity is measured by comparing the absorption intensity at 260 nm versus that at 280 nm. A ratio of about 2.0 is considered "pure" for RNA. Lower ratios indicate the presence of protein. UV-visible-NIR microscopes, UV-visible-NIR microspectrometers and Raman microspectrometers are general purpose laboratory instruments. They have not been cleared or approved by the European IVD Directive, the United States Food and Drug Administration or any other agency for diagnostic, clinical or other medical use.